A new paper which has been written by academics at Bristol University has proved that children who play sport or exercise with their closest friends are more likely to have a better level of overall fitness. While many adults will testify that working out in the gym or going for a run is easier with a ‘buddy’, the new research is the first time that academics have proved there is a link between children’s desire to exercise and the presence of a friend. The findings, which have been written by Dr Russ Jago and his colleagues at Bristol’s Centre for Exercise, Nutrition and Health Sciences, may well pave the way to encouraging more youngsters to do more sport and thus go some way to presenting a solution to the obesity crisis sweeping the nation. As more children turn towards their computers and games, and away from direct contact with their friends, the research is yet another reason to encourage youngsters to leave behind their bedrooms and get out and play with their friends. The study focused on the physical activity levels of ten and eleven year old children from across the country. 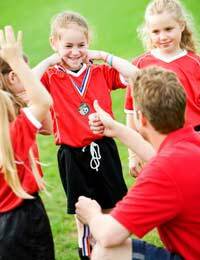 The researchers looked at the extent to which exercise and sport participation of children model that of their closest friends. The work was made possible with a grant from the British Heart Foundation. Almost 1,000 children took part in the study with about half of them completing physical activity and having a best friend with whom they closely identified. The overall findings resulted in a clear link between children whose friends exercised and the overall time spent exercising – at a moderate to vigorous level each day. In real terms, the study is, of course, of little value, until it is put into practice. But, as Dr Jago explains, with many youngsters not getting the recommended amount of physical activity each day, the findings can now be used to encourage more children to do more exercise – and find it fun as well. He said the research was one way of identifying new methods to encourage children to exercise more and that encouraging friends to spend time together away from school may well result in an increased level of exercise for these children. The study did take a separate look at boys and girls and the way in which their friends affected them. Both boys and girls increased their activity when taking part with their friends – with boys more likely to exercise for longer with a friend and girls more likely to do so with greater intensity. The research is part of a larger project in which the researchers will look at other elements of fitness and activity amongst children the same age group. The overall aim of the research as an entire body is to identify as many ways as possible of ensuring children’s activity levels are kept as high as possible to keep them as fit and healthy as possible. The British Heart Foundation said that the study proved there was a need to instil good habits in youngsters now by encouraging them to exercise with a friend in the hope that these habits would be taken with them into adulthood.